Mobile Dental | Aleph Group Inc.
Time is changing the way healthcare services work. It used to be a patient would schedule an appointment with their doctor to receive a checkup. However, not everyone has a doctor. Not everyone has a doctor near them to go to! 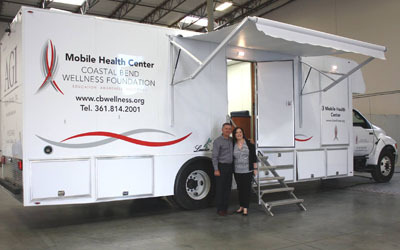 That’s how mobile health clinics are making a difference. In rural and underserved communities, mobile health clinics are giving health specialists the ability to be there for those who need health services when they need it, with little downtime. Doctors, dentists and other practitioners are all greatly benefiting from the use of a mobile health clinic. With that said, here are 4 benefits of having a mobile medical clinic that you may find applauding. In 2001, Aleph Group Inc. opened its doors with one goal in mind – to make a positive impact on people’s lives. Seventeen years later that goal has still not changed. We’re making a difference around the world, by supplying thousands of different services with specialty vehicles and mobile units who are then able to extend their helping hand past the walls of a fixed facility. When the times come where you need a mobile clinic for your special service, let Aleph Group Inc. be the one you make the call to. Just look at what we have to offer. Being a health professional is tough work. As if the journey to becoming one isn’t hard enough, you must also establish a practice and find ways to build a recurring patient list. Let’s not forget the amount of competition that stacks against you and continues to surmount every year! To make yourself known in today’s market, you’ve got to look at your options. The most unique approach to the situation would be a mobile health clinic. See, a mobile clinic mirrors everything you’d find in a traditional brick and mortar practicing – patient/testing rooms, reception area, restrooms and more. Interested? Here’s 5 things you need to consider when adding a mobile medical clinic to your practice. As a dentist, making sure your patients come to their appointment is crucial. A missed appointment is everything; that’s downtime between patients you can’t afford. If your patients aren’t making it to their appointments on time, consider getting a mobile dental clinic. What is a mobile dental clinic? True to its name, a mobile dental clinic is the simplest solution to ensuring your patients make it to their appointments. Not only is one convenient for you, it also gives your patients the option to never leave the comfort of their home to go to a dentist again! As a mobile dentist, you’ll be able to connect with new patients who normally don’t have access to traditional dental care. Interested? Check out these 3 simple tips for a successful mobile dental clinic! It’s a wonderful feeling to have your own practice after years of education, residency and perseverance. What’s even better is putting your practice on wheels and taking it wherever you want. That’s where a mobile health clinic comes in. Here’s what you need to know to get started. Nowadays, it pays off to extend your business past the brick and mortar of a building. A mobile medical clinic opens a brand-new avenue as to who and where you can take your prowess and help those in need. Our Mobile Health Clinics and Health Centers are custom fabricated to your needs so you can have a highly durable, efficient, and affordable vehicle. Copyright © 2017 Aleph Group, Inc. All rights reserved. Text and graphics are protected by US and International Copyright Laws, and may not be copied, reprinted, published, translated, hosted, or otherwise distributed by any means without explicit permission.